You heard it here first: The shoefie has made a comeback. If you merely glance over your favourite influencers' Insta feeds, I bet there's at least a shoefie (or five) to get you tapping that heart button. I spoke to Who What Wear's associate social media editor, Isabel Mundigo-Moore, who told me that our top-performing images on Instagram are consistently shoefies—evidently we love liking them as much as we love taking them. Adding to my theory, Isabel recently attended a talk given by the original shoefie queen, Eva Chen. Chen, director of fashion partnerships at Instagram, has over 800k followers, and she revealed that "mundane" shots are always popular—i.e., pictures of your shoes are destined to do well. And considering this is coming from the woman who started her own shoefie hashtag #evachenpose, it's clearly a way to win a few followers and likes. Who What Wear Editorial Director Hannah Almassi points out that shoefies' popularity could due to the fact that the trend works for women of every size and style affinity. She's clearly onto something: I spoke to Lyst, the global fashion search platform, about the shopping trends its experts have spotted in 2018, and it turns out the most-searched-for item this year so far is a pair of shoes: Vetements' unisex sock-boot sneakers. Balenciaga's speed trainers were in the top five most-viewed products this year, and since the beginning of fashion month, searches for Off White x Jimmy Choo shoes have increased by 40%. When the data says we're all shopping shoes, it makes sense that we're all snapping away at our feet. So how do you make the most of this trend and up your Instagram game? Keep scrolling for five tips you should try for your ultimate shoefie. Style Notes: Who says it has to be from the top down? 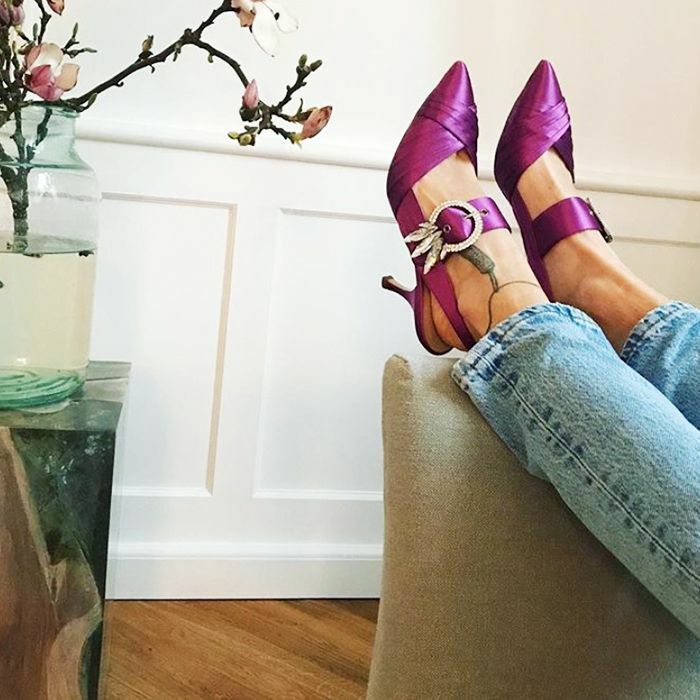 Lie across your sofa, or put your legs up in the air—you can take a shoefie from any angle you like. Style Notes: The realistic approach is always welcomed. Eva Chen is very much an advocate of not making it look too perfect. Style Notes: The shoes that are bound to catch your eye on the rack are also guaranteed to attract attention online too. Style Notes: Your shoes are made for walking, so show off what they can do by hanging out in chic cafés—include your coffee and sunnies for a touch of realism. Style Notes: If in doubt, take a tip from Eva and remember to inject some personality in your shoefies. For example the #evachenpose consists of shoes, a bag and a piece of fruit. It's literally the small things in this case that make a difference. Because pearl is another key trend of the moment. Millennial Pink is still a thing. Red suits everyone, don't you know? So fun and silly. But guaranteed to get the likes. There you have it—everything you need to ensure the success of your next shoefie attempt.